Retailers certainly thrive during the holiday season, but they aren’t the only ones taking consumers’ cash. Charitable organizations collect a large portion of their annual revenue in December. Charity Navigator reports that over 30% of annual giving via Network for Good’s donation processing system occurs during the last month of the year. And, the average American gives 4.7% of his or her income to charities every year. So many people and organizations need your help this holiday season. How do you decide who gets your donation and how much to give? This year, before you donate, ask yourself these five questions. 1) Is the charity reputable? If you’re giving to a large, well-established charity, this is an easy one. For instance, the Red Cross was established in 1881, so the organization has a long history of providing disaster relief, health and safety training, support for military families and more. This time of year is rife with scams, though. Avoid giving to charities who use telemarketers to gather donations, unless you can be absolutely sure who you’re giving your money (or worse, your credit card) to. And even if the telemarketing charity really is legit? Well, the odds are good that they’re spending a large portion of your donation on the services of the telemarketing company. 2) How much of my money goes directly to those in need? At the best-run charities, a large percentage of revenue collected goes directly to those in need. And not all charities are equal. Some give CEOs huge salaries (with your money!). Others can’t seem to figure out how to lower administrative costs. And others are disorganized and wasteful, so much of your dollars are being spent before they get to the people you thought you were helping. You can find financial information about most charities by visiting CharityNavigator.com or CharityWatch.com. And if a charity you’re interested in isn’t transparent about its numbers? Find another charity. 3) Do I feel strongly about this cause? Most of us don’t have huge trust funds, so we have a limited amount of money every year to donate to charity. If this is your reality, it’s important to choose a charity that spends its money on a cause that you really connect with. Make a list of causes that you’d like to support. If you don’t already know of a charity that’s working on behalf of that cause, look for some potential organizations online, using one of the sites mentioned above. Then, according to your budget, decide how many causes you can support this year, and which organizations will get your money. 4) Are my actions/donations really helping? If you’re not donating money through a charitable organization, you might look at giving directly to those in need. Make sure that your donations are effective. For instance, giving to this guy might make him happy (and a little more drunk), but might not have the same impact as buying Christmas dinner for a family affected by unemployment. Homeless shelters encourage donors to give directly to shelters, food banks or other agencies that assist homeless people. Some homeless people suffer from mental health issues or addictions. 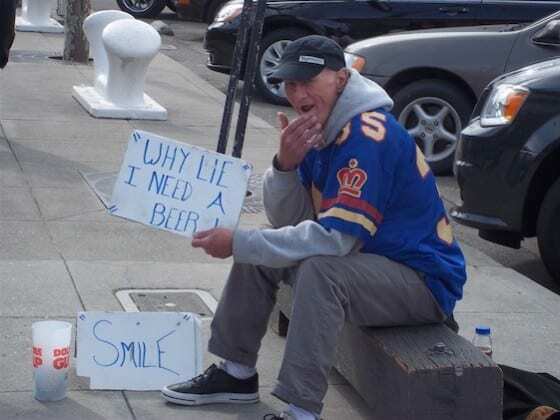 A direct cash donation to a panhandler might do more harm than good; whereas giving directly to an agency that serves that person could put food in his mouth or give him a bed for the night. 5) How can I help, beyond this donation? Even after the holidays, there will still be people all over the world in need of help. Now’s a great time to think more long-term. How can you help, beyond giving a holiday donation? Can you spend a few hours a month volunteering? Perhaps set aside a monthly contribution to support a worthy cause? Once you’ve answered these five questions, get out your checkbook and enjoy the true spirit of the holidays—helping those in need.